Owner JP McManus says the Grand National "should not be devalued" in future after the deaths of two horses, including his Cheltenham Gold Cup winner Synchronised. 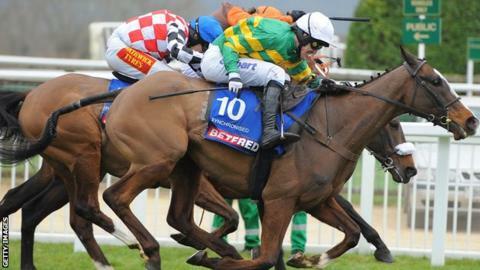 The nine-year-old, trained by Jonjo O'Neill, was one of two horses put down after suffering injuries at Aintree. The deaths in Saturday's race have raised criticisms about the safety of horses from opponents. But McManus said: "We all remain huge supporters of the Grand National." His statement added: "Despite all the sadness, as it is a truly fantastic spectacle. "It should not be devalued in any way." The Irish billionaire has spoken for the first time after Synchronised's death of his "sadness" and "devastation", in a joint statement with O'Neill, jockey AP McCoy and the owner's racing manager Frank Berry. Synchronised, who was bidding to become the first horse for 78 years to seal a Gold Cup and Grand National double in the same season, fell at the notorious Becher's Brook fence, unseating McCoy in the process. The gelding continued until the 11th fence where he suffered a leg fracture and later had to be put down. "Jonjo, AP, Frank and I, and all our families, feel a deep sadness and sense of devastation about the loss of the horse," said McManus. "We will always cherish the memory of how great he was in winning the Gold Cup at the festival the previous month. "What happened to him appears to be nothing more than a freak accident as his fall did not cause him to lose his life - it was running around loose afterwards. "It remains difficult to understand how it happened but regrettably it did." Synchronised's connections have moved to deflect the criticism levelled at Aintree by thanking course bosses for their "helpfulness, kindness and consideration" following the race, which was won by Neptune Collonges. Synchronised has been laid to rest at his Jackdaws Castle training base and McManus added: "He has left us all with a memory of what a superb equine athlete he was and his name is etched deep in the annals of jumping history as the winner of the Cheltenham Gold Cup. "We are all very proud of what he achieved for us and the sport as a whole." According to Pete also died after suffering a fractured leg when he was brought down after jumping the 22nd fence [Becher's Brook second time round]. His owner Peter Nelson has already indicated he will not enter horses into the race again.